At last month’s EdTechTeam South Africa Summit, it sometimes felt like I was witnessing magic. In a dazzling two-day whirlwind, we explored augmented reality, flipped classrooms, automagical differentiation, gamification, digital storytelling and more apps than I could count. The summit, which featured presenters from Google for Education, was all about what’s possible – and opportunities for technology to unleash creativity and enable individualised, child-driven learning are enormous. Tools like Socrative and Google Moderator, where learners respond to a question and then rate and respond to classmates’ answers, create space for everyone’s opinion to be heard – even kids who never raise their hand in class. Painfully shy learners can develop public speaking skills and confidence by recording presentations in private on a phone or tablet, then playing them back in class. Children with behaviour problems can excel when they are engaged through “gamifying” learning tasks and QR code-powered treasure hunts. We also heard stories from the classroom of kids’ innate fearlessness and creativity when confronted with new devices and software. Instead of letting a technical difficulty derail an ICT-based activity, North Carolina educator Dee Lanier asked grade 4 and 5 learners to find a cross-platform solution as part of the assignment. “If you tell learners in grade 4 or higher, ‘This is the problem’, they’re little hackers. They’ll solve it”, he told us. And we saw examples of technology broadening horizons and fueling change. One teacher created a class account on microfinance website kiva.org, and let learners debate and vote each week on their next loan – a task that concretised entrepreneurship and made faraway places real through research and individual stories. Other learners have used tech to reshape the world around them, like a group of California teens who used location-tagged photos to map litter in their community, and approached businesses and government to ask for more rubbish bins. Realising these opportunities in South Africa calls for specific, innovative strategies that recognise both hard realities and opportunities. The Google for Education team of US-based teachers quickly learned that ICT for learning is a whole different ballgame here, as they improvised bravely in the face of a sporadic internet connection. Department of Basic Education data shows that only 23% of South African schools had computer centres in 2011, and less than half of them were stocked. Even well-resourced schools, like our conference venue Dainfern College, struggle to secure reliable connectivity and fast, unlimited bandwidth. Closing our “digital divide” is important, but it is not enough. Research shows that while tech is often lauded for its potential to level the playing field, how people use technology is just as important as whether they have it. One recent study highlighted that it can in fact exacerbate inequality when children are not supported by the “scaffolding” of confident, motivated teachers and engaged, supportive parents. ICTs are not a quick fix to the complex challenges our education system faces. At the same time, leapfrogging past computer labs to reach learners on mobile devices also presents huge opportunities for impact, particularly on mobile phones – an area I would have liked to hear more about at the summit, where discussion of “going mobile” was centred primarily on tablets. While children who have never seen a tablet may not be “little hackers” by grade 5, South African young people navigate Mxit nimbly in a way many adults will never understand. And education tools in South Africa are increasingly reaching learners where they are: on mobile phones. 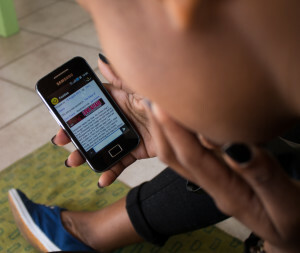 Using minimal data, children and teens with access to feature phones can read stories on Nal’ibali and FunDza’s Mxit apps and mobisites, and grade 8-12 students can learn maths and science on Rethink Education’s cog-based Mxit tutoring platform, to name a few examples. To leverage tech’s potential to enable individualised, creative learning, we cannot simply transplant solutions from overseas, though these offer valuable opportunities to learn. Closing hardware, software and connectivity gaps are key, but we must also develop strategies to reach young people via technology that is already in their hands, and focus on the human relationships that lie at the heart of progress – teachers, parents and school management teams, and their relationships to technology and to children.